Start by Stamping the diamond background from BPM Classic Spark Stamp Set with embossing ink and cover with Patina Oxide Seth Apter Embossing Powder and heat emboss. I just love the yummy texture and color this embossing powder provides! Stamp Rosettes from BPM Background Grunge Stamp Set and embossing with White embossing powder. 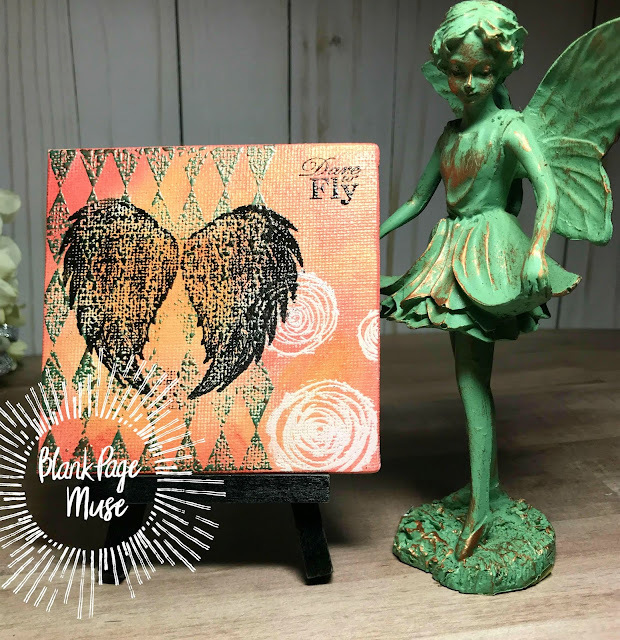 Stamp Wings from BPM Classic Spark Stamp Set and emboss with Black Embossing powder. Stamp Dare to Fly from BPM Inhale...Exhale Stamp Set and emboss with black embossing powder. Using blender cover background with Distress inks with colors as desired. Wiping ink off of the embossed images! Here is a close up of the finished project!